Tesla has just been awarded its largest contract to date to build a 20 megawatt (MW) battery storage facility after the worst methane gas leak in U.S. history left California utilities hunting for new energy backup resources. Tesla was awarded a contract by Southern California Edison (SCE) to have the lithium-ion battery storage facility up and running by the end of this year. "It is remarkable that this facility is going to be built in just a few months, a technology fix that could never be replicated with fossil fuel-based infrastructure," said Amit Ronen, director of Solar Institute at George Washington University. "Today’s announcement highlights how quickly batteries are becoming an economical and preferable solution to meeting the demands of our modern day electricity grid." While Tesla did not disclose the price of the contract, a similar 20MW facility also being built for SCE by by AltaGas Ltd. is valued at between $40 million and $45 million. 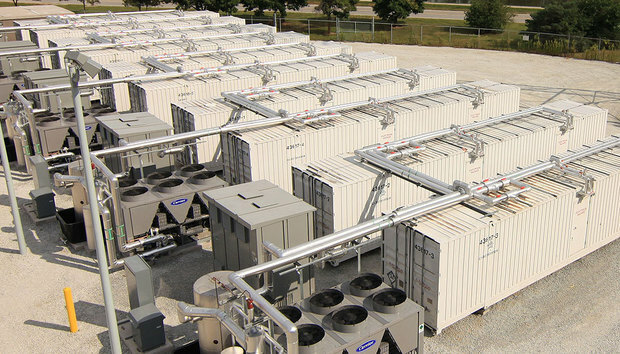 AltaGas will build a 20MW battery storage system at its Pomona site in southern Calif.
Tesla's contract was spurred by a legislative mandate requiring several utilities to supplement gas-fired power plants with battery storage plants after the Aliso Canyon Gas Storage facility was closed after a catastrophic leak. In April, the Aliso Canyon site was permanently sealed with concrete after having ruptured the previous October. The methane storage plant is owned by Southern California Gas (SoCalGas) and located in the Aliso Canyon storage field near the Porter Ranch neighborhood of Los Angeles. The Aliso Canyon facility had been feeding the network of natural gas "peaker" power plants in the Los Angeles basin. Peaker plants are typically only used to supplement a power requirements during peak demand. Equipment on a ridge above a natural gas well that is part of Southern California Gas Company's enormous Aliso Canyon facility. The gas well was the site of the largest natural gas leak in U.S. history. For its part, Tesla said that upon completion its system will be "the largest lithium ion battery storage project in the world. "When fully charged, this system will hold enough energy to power more than 2,500 households for a day or charge 1,000 Tesla vehicles," Tesla said in a blog Thursday. Tesla, however, is not alone in being awarded battery storage facility contracts, and while its will be the largest facility upon completion, that title will not be long held. In August, AltaGas Ltd. was awarded a contract by SCE to build a 20MW facility this year on the site of its natural gas plant in Pomona, and AES Corp. won a bid to build a grid-scale energy storage system with 37.5MW of capacity for San Diego Gas & Electric (SDG&E) -- 30MW in Escondido and 7.5MW in El Cajon. AES's facility is scheduled to be operational by the end of January 2017. Once completed, the Escondido array will be the largest battery-based energy storage project in operation in the U.S.
"These batteries are beneficial because they maintain a reliable flow of energy to customers when they need it most," James Avery, SDG&E's chief development officer, said in a statement. "We also are national leaders in supplying renewable resources, with more than 33% of the energy we supply to customers coming from wind and solar. These batteries will help smoothly integrate this growing supply of clean energy onto the power grid for use by our customers." Finding cost-effective ways to store electricity is critical to scaling up not only clean but intermittent resources like wind and solar energy, Ronen said. While the marketplace will decide which energy storage technologies will work best for which situation, batteries are particularly promising, he said, because they can instantly deliver the reliable and resilient power needed to power a digital economy. The California Public Utilities Commission (CPUC) ordered Southern California Edison, PG&E and other utilities to solicit more utility-scale energy storage solutions that could be operational by Dec. 31, 2016. In all, CPUC is requiring utilities to meet a target of 1,325MW of additional power storage by 2020. In July, Tesla Motors announced that it is morphing from being just an all-electric car maker to being a clean energy corporation. In August, the company announced it was acquiring SolarCity, which was founded by Tesla CEO Elon Musk and his two cousins and is one of the nation's largest solar installers. Musk is also the chairman of SolarCity and a majority stockholder. SolarCity already sells Tesla's Powerwall and Powerpack lithium-ion battery storage products, which are made in Tesla's Gigafactory outside of Reno, Nev.
Tesla has also announced it will begin building its own microgrids, which can act as small, independent power generation and storage facilities for cities, corporate campuses, military bases or remote locations such as islands. "I found it notable that not only is this project being used to help solve problems associated with the largest methane leak in U.S. history, but also that the batteries being used will be sourced from the same U.S. factory that is producing batteries for electric cars that will help reduce emissions from the transportation sector," Ronin said.